Freeways are major rural and urban arterial roadways with full control of access. They are intended to provide for high levels of safety and efficiency in the movement of large volumes of traffic at high speeds. Control of access refers to the regulation of public access rights to and from properties abutting the roadway. With full control of access, preference is given to through traffic by only providing access connections with selected public roads. At-grade crossings and direct private driveway connections are prohibited. The principal advantages of access control include preservation of roadway capacity, higher speeds and improved safety for the roadway user. Roadways with fully controlled access have grade separations at all railroads and grade separations or interchanges at selected public crossroads (additional information can be found in Access Management Guidelines). The remaining crossroads are interconnected or terminated. 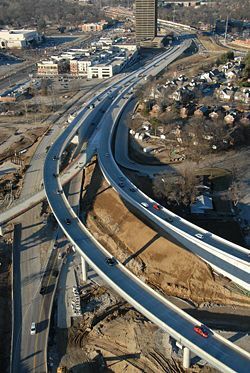 Essential freeway elements include the roadway, medians, grade separations at crossroads, ramps to and from the traveled way at selected locations and in some cases frontage/outer/service roads (typical sections are available). must be maintained by the state. The inside shoulder of all outer roadways must be marked with the "No Right of Access" symbol. must be maintained by the state where located within the controlled access right of way and may be maintained by the state where located or constructed on normal access right of way. The inside shoulder of service roads located within controlled access right of way must be marked with the "No Right of Access" symbol. Roadways not meeting the criteria described above for outer roadways or service roads must be constructed on right of way outside the limits of the normal controlled access right of way and must be maintained by the local political subdivision. These roadways are to be designated by a term descriptive of their function, i.e., relocated local road, relocated city street, county road extension, etc. This page was last modified on 3 August 2010, at 15:08.